Having been engaged in other work all summer, I get to Fall and yet again it seems to be Westerns on every side, or "revisionist" Westerns, as the current term dictates. The latest is "The Homesman" directed and starring Tommy Lee Jones, but few notices I've seen mention the brains and craft behind the story - the novelist Glendon Swarthout 1918-1992. Like a shadow of his subject matter, the man has been a long time gone, and yet he still exerts a pull that can only be admired. Not for him the glossy and pasteurised vision of the Old West. From Swarthout's West came The Shootist, Bless The Beasts And Children, They Came To Cordura and a whole lot more. 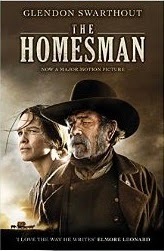 The Homesman takes its water from the same creek as Thomas Eidson's The Missing, even The Unforgiven, in that I'll read it, watch it, muse on it, and be grateful I don't live in the time when such decisions had to be borne almost alone. 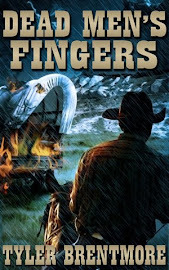 Dead Men's Fingers heralds the first of a series of Westerns in the classic style. Tyler Brentmore is the pseudonym of an award-winning writer of historical and thriller fiction.